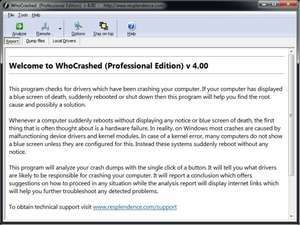 While Microsoft rarely offers so much advice when dealing with a BSOD, there are some other troubleshooting options available and this time it's with WhoCrashed Free Home Edition. The freeware edition of WhoCrashed may help. With WhoCrashed Free, you can analyze the data available from your last blue screen. Version 6.60.3.30216 is a freeware program which does not have restrictions and it's free so it doesn't cost anything. For security reasons, you should also check out the WhoCrashed Free Home Edition download at LO4D.com which includes virus and malware tests. Additional screenshots of this application download may be available, too. WhoCrashed Free download been highly rated by our users.